Institute of Banking Personnel Selection is planning to release IBPS RRB PO Admit Card 2019 shortly. However, you can use the direct link present here to access IBPS RRB Probationary Officer Scale 1 Admit Card. Visit the official website of IBPS i.e. www.ibps.in for more details on IBPS Regional Rural Bank PO Call Letter. Furthermore, this article gives you knowledge on simple steps to download IBPS RRB PO 2019 Admit Card. Moreover, you can also learn about IBPS Probationary Officer Hall Ticket Release Date, PO Exam Date here. Stay Connected to our page for latest updates on IBPS RRB PO 2019 Admit Card. News: IBPS RRB Officer Scale 1(PO) Exam Date Released. Check Below for IBPS RRB PO Prelims & Mains Exam Schedule 2019. Great news for Job Seekers trying to establish a career in Banking Sector. Recently, Institute of Banking Personnel Selection issued a notification to fill up various vacancies for Probationary Officer. A large number of candidates have applied and are eager about Admit Card of IBPS RRB PO. However, you can relax now as you will get complete information regarding IBPS RRB Probationary Officer Call Letter 2019. Also, be ready with the necessary credentials like Registration Number, Date of Birth beforehand to download IBPS Officer Scale 1 Admit Card with ease. Stick to this page for day to day happening news on IBPS RRB Probationary Officer Hall Ticket. Examination Name RRB PO 2019. Last date for Application July 2019. Download of Call letters for Prelims July 2019. IBPS RRB PO Prelims Exam Date – 3rd, 4th, 11th, 17th, 18th & 25th August 2019. RRB IBPS Mains Officer Scale 1 Exam Date – 22nd September 2019. Institute of Banking Personnel Selection RRB PO Admit Card is available for download. In general, candidates are advised to carry few additional documents to the Examination Hall as the invigilator uses them for validation purpose. Furthermore, aspirants will not be permitted to write the IBPS RRB Probationary Officer Exam on the absence of Admit Card of IBPS RRB. Also, contenders are recommended to check the details printed on IBPS RRB Officer Scale 1 Hall Ticket i.e. before attending the exam. IBPS Regional Rural Bank PO Hall Ticket 2019 will not be sent by either post or to your Email ID. So, it is suggested to download your IBPS RRB Probationary Officer Admit Card from the official website or from here. In fact, the candidates who cleared the Prelims Exam will be called for the Mains Exam. However, you can also get your IBPS RRB PO Mains Admit Card 2019 here. Find the desired link named IBPS RRB PO Admit Card 2019 on the home page. Later, click on that suitable link of IBPS RRB PO Exam Admit Card. Enter the necessary fields like Registration Number, Date of Bith during the time of Login. Verify the details entered and press the Submit Button. 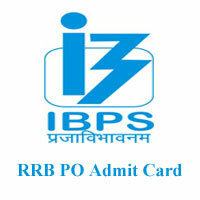 Finally, take a print out of RRB IBPS PO Exam Admit Card, keep it for future usage. Exam Name: RRB Officers ScaleI, II & III Exam 2019.
a) IBPS RRB PO Prelims Exam Date – 3rd, 4th, 11th, 17th, 18th & 25th August 2019.
b) IBPS RRB Probationary Officer Mains Exam Date – 22nd September 2019.